Clubfoot, also known as congenital talipes equinovarus (CTEV) is one of the most common, non-life threatening, major birth defects among infants globally. 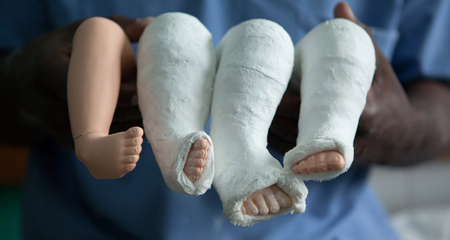 Approximately one in every 1,000 newborns has clubfoot. Of those, one in three have both feet clubbed. The exact cause is unknown. Two out of three clubfoot babies are boys. Clubfoot is twice as likely to occur if one or both parents and/or a sibling has had it. Less severe infant foot problems are often incorrectly called clubfoot. If you suspect your child has clubfoot, contact one of the Foot and Ankle surgeons at Academy Foot & Ankle Specialists for treatment.